Did you know that Agatha Christie and her husband may have been among the first Britons to learn how to surf standing up? * Me either. 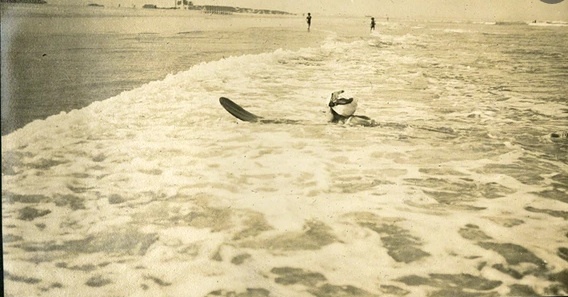 According to Pete Robinson, founder of the Museum of British Surfing, Agatha Christie and her first husband, Archie, learned to surf while on a world tour to promote the British Empire Exhibition of 1924. They first encountered surf boards on the beaches of South Africa in January 1922, but it wasn’t until Christie and her husband landed in Waikiki, Hawaii in August that they mastered the art of surfing while standing up. *She wasn’t the very first. That honor apparently belongs to Prince Edward. At least, so far.